That means, if you want to fly one of those airlines but still use PreCheck, you need to fly with one of their codesharing partners. For example, if you wanted to fly to The Netherlands, which is normally a KLM flight, you can still book your ticket through Delta, since they’re codesharing partners. And even if your plane is a KLM aircraft, you have a Delta ticket, which means you can go through TSA Precheck when you depart the U.S. Of course, returning from Schiphol Airport means you won’t be able to use it, but at least you can benefit on one leg of the trip. Don’t forget, if you use certain corporate or personal credit cards, you can possibly get your PreCheck application fee reimbursed. 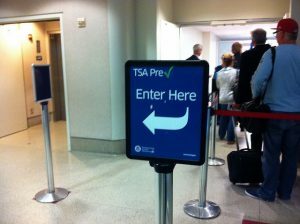 For more information about which airlines and airports accept TSA PreCheck, go to their PreCheck map. Are you a PreCheck or Global Entry user? How does it help with your travels? Any times it has come in handy? Share some stories with us in the comments below, on our Facebook page, orin our Twitter stream.